Masahiro Tanaka threw a complete game shutout, as he scattered just three hits and a walk, while striking out nine, to improve to 8-2 on the season. The Yankees manufactured runs throughout the game, starting when Didi Gregorius got an RBI groundout in the first. Austin Romine had an RBI groundout in the fifth, followed by a sacrifice fly in the seventh, and Neil Walker got an RBI single in the ninth to make it 4-0. Chicago opened the scoring in the top of the second when Albert Belle led off the frame with a solo home run off Yankees starter David Wells. The Yankees came right back in the bottom half of the second when Jorge Posada hit a two-run homer. Bernie Williams got an RBI single in the third to make it 3-1. In the top of the fifth, Ray Durham hit a two-run homer to tie it up, and the Yankees responded in the bottom of the sixth when Bernie Williams led off the frame with a solo homer, followed by a two-run single from Scott Brosius that made it 6-3. Wells got the win and improve to 12-2, as he went 7 2/3, allowing three runs on seven hits and four walks, with four strikeouts. Mariano Rivera pitched the final inning-and-a-third to earn his 27th save of the season. 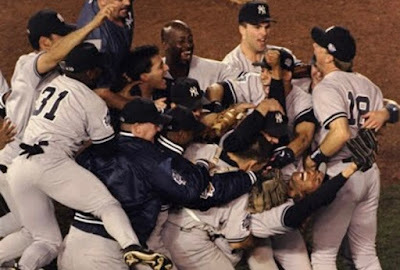 Where they stand: The 2018 Yankees (64-35) remain nine games off the pace of the 1998 team, which was 73-26 through 99 games.